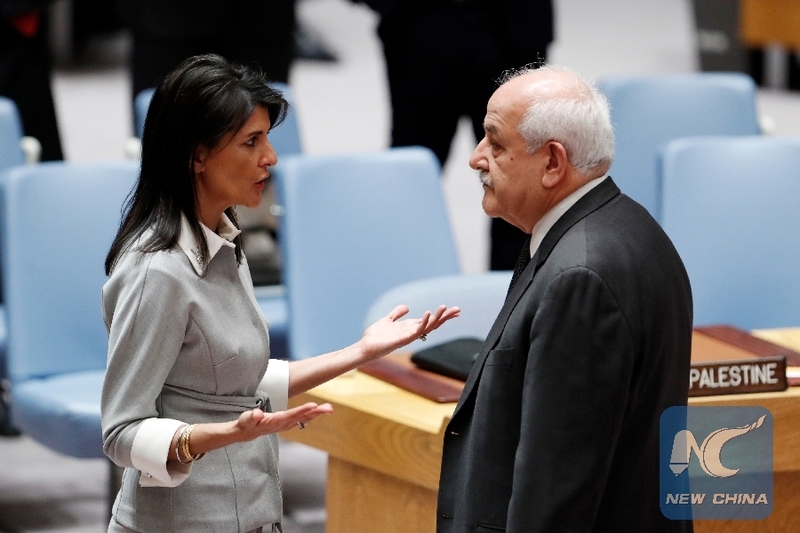 UNITED NATIONS, Dec. 18 (Xinhua) -- Permanent Observer of Palestine to the United Nations (UN) Riyad Mansour on Tuesday criticized Nikki Haley, the outgoing U.S. ambassador to the UN, for hostility towards the Palestinian people. "Ambassador Haley, unfortunately, exhibited an excessive amount of hostility to the Palestinian people and to the Palestinian cause," Mansour told reporters after a Security Council meeting on the question of Palestine. Haley was more aggressive and more pro-Israeli than previous U.S. ambassadors, he said. "Different representatives of the United States were always showing massive support to Israel. But yet at the same time, there was a bit more balance in terms of not ignoring the Palestinian side completely," said Mansour, who has seen many U.S. ambassadors to the UN since he started serving in the post in 2005. Haley, who is stepping down at the end of the month, made her last statement on the issue of Palestine at Tuesday's Security Council meeting. She will be replaced by Heather Nauert, the current U.S. State Department spokesperson. In her speech, Haley asked Israelis and Palestinians to engage in a new Middle East peace plan yet to be unveiled by the Trump administration. The plan contains elements that both sides will like and dislike, noted Haley, who said she had read the plan. She asked Israelis and Palestinians to focus on parts they like and encouraged negotiations to move forward. "Both sides would benefit greatly from a peace agreement, but the Palestinians would benefit more, and the Israelis would risk more," said Haley. Mansour said Haley's speech contained the same theme she had started with two years ago. She did not convince any of the 14 members of the Security Council to replace the global consensus regarding the issue of Palestine with other ideas, Mansour said. "Any other ideas that might be contemplated by the current U.S. administration to replace this global consensus ... will not have a chance of succeeding. It's dead on arrival," he said. Mansour commended the position of the current and upcoming EU members in the Security Council. The current and upcoming EU members on Tuesday reaffirmed their commitment to "the internationally agreed parameters for a just and lasting peace in the Middle East based on international law, relevant UN resolutions and previous agreements." Any peace plan that fails to recognize these internationally agreed parameters would risk being condemned to failure, said the EU members in a statement. The statement was read to reporters in Mansour's presence before the Security Council meeting by Karel van Oosterom, the Dutch ambassador to the UN, on behalf of the eight EU countries of Britain, France, the Netherlands, Sweden, Poland -- the current EU members in the Security Council -- and Belgium, Germany and Italy. Belgium and Germany will become council members next year, and Italy split a two-year council term with the Netherlands.